Written by the Greek Forum of Refugees, member of the Asylum Corner Network. 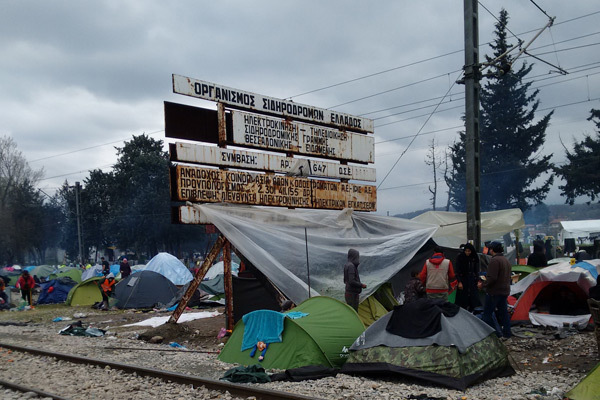 Greek Forum of Refugees has visited Idomeni, after a march of 2000 people had started in an attempt to go to Central Europe on Monday, March 14th. We talked to those who have taken part in the march and whitnessed human rights abuses and illegal push backs by FYROM authorities. About 10.000 people, many of them lacking basic provision, are forced to stay in Idomeni, which has – after days of rain and bad weather – turned into a mudhole. Monday had been the first day without rain. But, due to the rain rivers have swelled and on Sunday, three Afghans drowned in a desprerate attempt to cross to FYROM. Refugees made the dangerous journey through the river because of the fence built by FYROM to preventing people from entering its territory. “We went two days ago and tried to cross the border. We crossed the river, the way was very difficult. But the FYROM Police cought us, split us into many small groups, put us on old trucks and drove us to the mountaintop where they pushed us back to Greece. They told us to not try again”, a Syrian man who had participated in Monday’s march informed us. However, despite the past experience of police violence in FYROM, and an increased police presence in the camp, the situation is calmer than expected. People are waiting and hoping for today’s EU summit to bring a positive outcome. “Greece has been very nice and polite with us, that’s why we are patient here. I don’t understand why Europe does not care about us, or at least the children, for whom this place is dangerous”, a young Iraqi man says, who came here with his wife and children. Their tent is at the edge of the huge camp. He introduces us to his family, and we are surprised: His cousin, who has a residence permit in the UK, came down to Idomeni to support his family. The waiting prevails. Despite the expectations placed on the summit, it is unlikely to bring positive results or an opening of the route. The EU’s plans of “exchanging” refugees with Turkey or pushing them back shows no respect for the wishes of the refugees. Monday’s march has once more shown the strong will of people to go to Nothern Europe, and not back to Athens or Central Greece. The march demonstrated that these people will endure all hell in order to realize this plan. Even the busses waiting to take people back to Greece, ready to depart and seeming like a cosy haven in the cold and rainy nights, won’t keep people from staying here. The Greek police are present handing out information sheets, advising people not to cross the border, informing on the extreme dangerous. Many refugees started to discuss other possibilities.